What were you doing in 1898? Okay, none of us were born. 1898 was, in fact, a big year. Hawaii was annexed to the United States. Brooklyn merged with New York. The first phone message from a submerged submarine was transmitted. Pierre and Marie Curie discovered radium. Australia annihilated England 4:1 in the Ashes. The first games of the Italian Football League were played. Will Kellogg invented Corn Flakes. The roller coaster was patented. Also in 1898, pharmacist Caleb Bradham invented the recipe for Pepsi-Cola in New Bern, North Carolina. He was not the first. John Pemberton, a pharmacist based in Atlanta, had already created the Coca-Cola syrup in 1886. Back then, soda fountains were a popular additional revenue stream for pharmacies. The secret to success, of course, was having the best soda. And so the soda wars began. A fabulous info-graphic from CNNTees sets out the early rivalry between Coca-Cola (in ‘Spencerian script’ since the very beginning). The early recipes are well worth a look. Note the common essential ingredient: alcohol. In 2014, alcohol might be long gone from the recipe but the soda wars continue. The most recent stoush concerns bottles. In the last 12 months, Coca-Cola has sued Pepsi-Cola in a number of countries over Pepsi’s Carolina Bottle, claiming that it infringes Coca-Cola’s Contour Bottle trade mark. The Contour Bottle has been an essential part of the Coca-Cola stable since 1916. In a Federal Court of Australia judgment on 28 November 2014, Besanko J found against Coca-Cola. He held that Pepsi’s Carolina Bottle did not cross the line. The thrust of Coke’s case does not involve rocket science. It is easy to imagine the scenes at Marketing HQ when Pepsi’s (then) new bottle was first identified: ‘They are our biggest trade rival. And after all this time, they have launched a bottle which looks like our Contour Bottle’. Clearly, there was a basis for complaint. How then, does the Court consider whether Pepsi has crossed the line? In short, in Australia, whether the claim is for trade mark infringement, misleading or deceptive conduct (s.18 Australian Consumer Law) or passing off, the focus is less on the conduct, and more on the reactions of consumers. The court will not intervene if the consumer is not confused (trade mark infringement) or in error (s.18 ACL and passing off) about trade source. The opponent’s conduct (an ‘intention to mislead’) is not typically relevant, although courts are sometimes prepared to consider this factor, whether tacitly or overtly, if there is clear evidence of copying. Coca-Cola argued that this was such a case. The lack of apparently clear evidence of copying or intention to mislead. 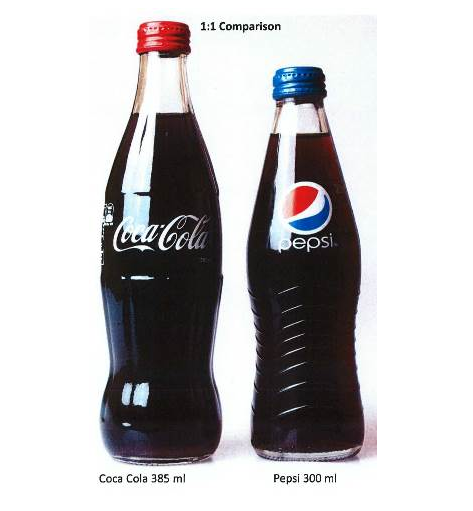 For trade mark enthusiasts, the judge did find that Pepsi was intending to use its Carolina Bottle as a trade mark. This is the first step towards a trade mark infringement finding. However, it did not get Coca-Cola very far. Besanko J decided that “[i]t is the overall shape of the Carolina bottle which is distinctive and I think it achieved what it set out to do”. He pointed, in particular, to the horizontal waves on the bottle. It is therefore no surprise that the judge found the bottle was not deceptively similar. In short, it was not close enough to being an exact copy of what he regarded as the essential features for it to be a problem with consumers. So too, the misleading or deceptive conduct, and passing off claims failed. One can bring in more surrounding context to assess these claims. As Besanko J said: “…the words “Coca-Cola” in Spencerian script would be one of the world’s most recognizable advertising images. In all these circumstances, it is difficult to see why an ordinary consumer would not make his or her purchasing decision by reference to the brand names, device marks or logos”. Again, even accepting that the consumer might self-select from the fridge with minimal purchase involvement, the judge otherwise felt that Pepsi’s bottle was sufficiently different not to lead the consumer into error. The challenge for Coke is that it must take action if someone is challenging its intellectual property rights. Otherwise, there is a risk the Contour Bottle will become generic. “Use it or lose it” is the mantra of intellectual property law. In the present case though, one is entitled to ask: How close is too close? Perhaps the lesson – in the case of a close competitor – is that the packaging would have to be very close indeed. What will the landscape between these two competitors look like in 2098? Possibly, very little will change but the technology.